Vaughn from Warehouse Guitar Speakers gave us some real props on his recent blog! "Howdy folks! It’s time to shine the spotlight on another Amp Builder with the wisdom to choose WGS speakers. 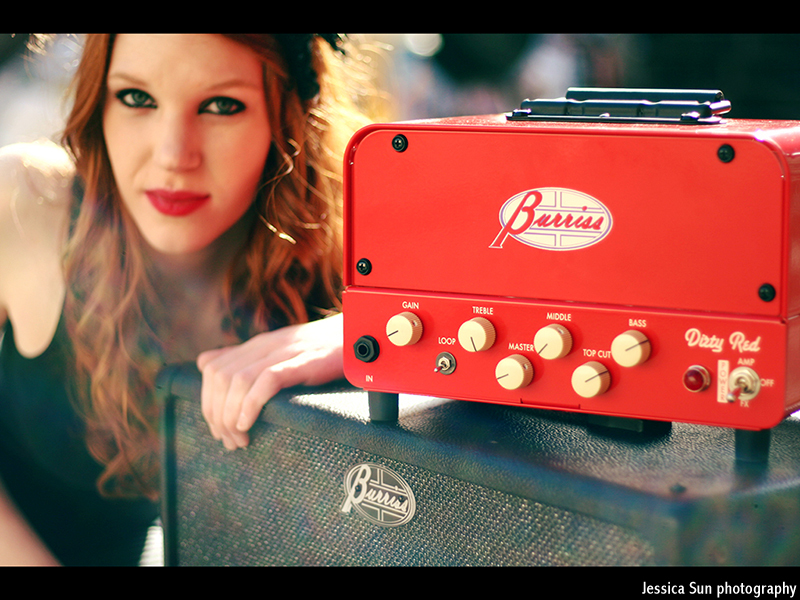 This week I’m featuring Bob Burriss and the Burriss amp line. In Bob’s case "wisdom" is an understatement; the guy’s a freaking genius, he can smell good tone. I get the feeling he’s like Ken Fischer without the baggage. Only time will tell if Bob’s amps will one day demand the respect of Ken’s Trainwrecks. Personally, I wouldn’t be surprised. Why? Well, READ ON! 11.5" x 7.13" x 6.75"
Serious Iron! Huge custom power and output trannys. Most important: out of this world freeking tone! Okay, before I go any further, I must state the obvious: This is not going to be an un-biased review. I own this amp, I love this amp. There, enough with the disclaimers! Now, for a few of my personal observations: First, the reverb, I still can’t believe Bob got a spring reverb to sound so darn good whilst being contained in such a little box. The Dwell control on the verb is a nice little nod to the amps vintage vibe. Second, the tremolo, this is holy-cow, jee-willikers, hi-krumba level tremolo. Warning: before engaging the tremolo, take a few deep breaths and sit down. This will take your breath away. Call it hypnotic, lush, whatever you want; it’s what tremolo should be. Oh, and the coolest part of all, the amp can function as a stand-alone effects and/or front end unit (sans speakers). Don’t even consider buying a repro Fender stand-alone spring reverb unit; just pick up one of these. It’s a great spring verb unit, a smashing tremolo unit, oh ... and a great sounding amp! But wait, there’s more, oh so much more. For all the details check out the Burriss site; but I’ll mention a few that really rock my world. Remember those custom trannys I mentioned? Well, the OT has 4, 8, and 16 ohm taps- always a cool thing. But cooler still: Bob had his power trannys wired with an extra tap for pedal power. When you put the tiny lil tremolo switch on your pedal-board, guess what? It can also power your entire pedal board. Seriously, I’m not kidding. The next uber-cool feature is the effects send and return - each sporting their own level control, this loop works with anything from guitar stomp boxes to line-level rack mount boxes. In a quick jam situation, your bass player can plug into the return jack too, cool, huh? Okay, so it’s got a few bells-n-whistles, so do a bunch of crappy sounding amps, right? The $50K question is: how does it sound? Well, if you like a tone that is both fat, and juicy while also possessing a velvet-smooth fender-esque top end and a level of touch-sensitivity that makes an amp feel as though it can read your very thoughts and desires ... well then, this is an amp you will like. It’s got enough headroom to keep up with a live drummer, and also sounds very rewarding at bedroom levels. Like I said, this amp leaves nothing to be desired. And all that is pushed by a pair of EL84’s, I’ve never even LIKED any EL84 amp before ... go figure. It’s like I said in last week’s teaser: this amp rocks like none other, it totally re-invents what and how you play. Yes, an amp can do that." We have visited our own site 28503 times!